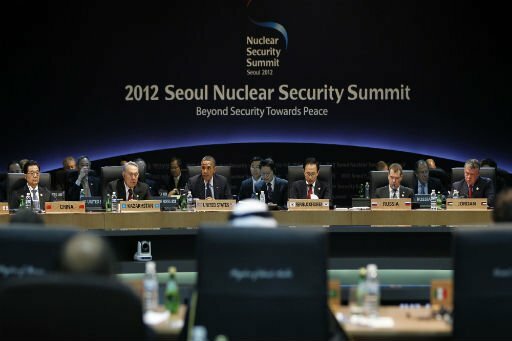 Almost 60 leaders from around the world attending 2012 Seoul Nuclear Security Summit have called for closer co-operation to tackle the threat of nuclear terrorism. South Korean President Lee Myung-Bak said nuclear terrorism remained a “grave threat”, while US President Barack Obama said action was key. Chinese President Hu Jintao urged the group to work together on the issue. The meeting has so far been dominated by North Korea’s plan to launch a rocket next month. North Korea says the long-range rocket will carry a satellite. The US says any launch would violate UN resolutions and constitute a missile test. Iran’s nuclear programme was also on the minds of the summit participants, with Barack Obama pledging to meet the leaders of Russia and China on the sidelines to work towards a resolution. At the summit, world leaders are discussing measures to fight the threat of nuclear terrorism, including the protection of nuclear materials and facilities, as well as the prevention of trafficking of nuclear materials. There are currently no binding international agreements on how to protect nuclear material stored peacefully inside its home country. An amendment seeking to do that is still unratified after seven years. Addressing the summit, Barack Obama warned there were still “too many bad actors” who were threatening to stockpile and use ”dangerous” nuclear material. “It would not take much, just a handful or so of these materials, to kill hundreds of thousands of innocent people and that’s not an exaggeration, that’s the reality that we face,” Barack Obama said. Hu Jintao called for “an international environment conducive to boosting nuclear security” to be created and Lee Myung-Bak called for concrete action to tackle a threat that posed “a grave challenge” to peace. The summit, attending by almost 60 leaders from around the world, is due to issue a communiqué later in the day. Meetings on Monday were overshadowed by North Korea’s planned launch, scheduled to take place between 12 and 16 April. Pyongyang says it is intended to mark the 100th anniversary of the birth of North Korea’s founding leader Kim Il-Sung. On Tuesday, a North Korean foreign ministry spokesman said that the launch will go ahead as planned and criticized Barack Obama’s stance as ”confrontational”. North Korea ”will never give up the launch of a satellite for peaceful purposes”’, the spokesman said in a statement in the official KCNA news agency. A report by the KCNA also described the ”weather satellite” Pyongyang planned to launch as useful for ”the study of weather forecast needed for agriculture and other economic fields”. Japanese Prime Minister Yoshihiko Noda, speaking at the summit, called on Pyongyang to cancel the rocket launch, saying that it would violate UN Security Council resolutions. “As such, the international community strongly urges North Korea to exercise restraint and cancel the launch,” Yoshihiko Noda said. The resolutions were passed after a similar launch in April 2009. Japan is particularly concerned as that rocket was launched over the country three years ago. The US and Chinese presidents met on Monday on the sidelines of the summit and agreed to co-ordinate their response to any “potential provocation” if Pyongyang went ahead with the launch. South Korea and the US say North Korea risks further sanctions and isolation if it does not cancel its plans. Seoul has also warned it will shoot down the rocket if it strays over South Korean territory. Addressing Iran, Barack Obama said on Monday that there was still time to resolve the impasse over its nuclear programme through diplomacy. “But time is short,” Barack Obama warned. Iran insists there is no military element to its programme but Western powers fear it is constructing nuclear weapons.